Build your own Internet of Things (IoT) projects for prototyping and proof-of-concept purposes. This book contains the tools needed to build a prototype of your design, sense the environment, communicate with the Internet (over the Internet and Machine to Machine communications) and display the results. Raspberry Pi IoT Projects provides several IoT projects and designs are shown from the start to the finish including an IoT Heartbeat Monitor, an IoT Swarm, IoT Solar Powered Weather Station, an IoT iBeacon Application and a RFID (Radio Frequency Identification) IoT Inventory Tracking System. The software is presented as reusable libraries, primarily in Python and C with full source code available. 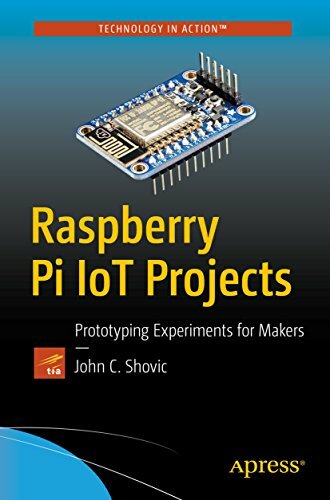 Raspberry Pi IoT Projects: Prototyping Experiments for Makers is also a valuable learning resource for classrooms and learning labs. Primary audience are those with some technical background, but not necessarily engineers. It will also appeal to technical people wanting to learn about the Raspberry Pi in a project-oriented method.